Aspira is hiring part-time Work at Home Reservations and Licensing Sales Agents. You’d be helping customers with camping, tours & activity reservations as well as hunting & fishing licensing needs across North America. Pay varies depending on your state and is based on your state’s minimum wage. Currently, the company is hiring in FL, GA, ID, IN, KY, MD, MS, NY, OH, OR, PA, TX and UT. Please note that while the site lists specific cities, the job descriptions indicate they hire STATE WIDE. “Aspira is looking for remote customer service agents. This is a remote position working from the comfort of your own home. 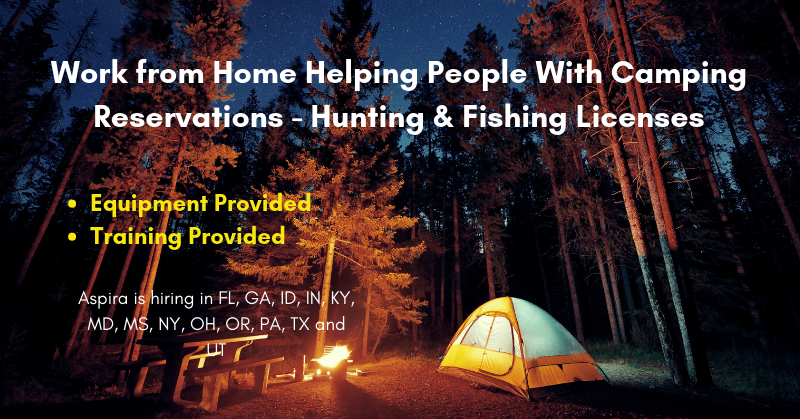 Our Work-At-Home Department has been connecting customers with camping, tours & activity reservations as well as hunting & fishing licensing needs across North America since 2006. There are no out-bound calling or sales/commission requirements; we pay hourly, paychecks are bi- weekly, direct deposit is available, and W2 provided. What makes a successful Reservation and Licensing Sales Agent? Standard phone line. First choice is POTS/Analog phone landline. We can accept some cable/digital providers. Please, no cell, satellite or VoIP providers. High Speed internet connection and be able to be connected directly to the vendor’s modem by Ethernet cable. Direct wire to modem and phone line accessible to your intended work station. Have a desk top monitor that is not an all-in-one computer, tablet, laptop or TV. Assist your customers over the phone and/or chat and messaging with their requests, answer questions, and light trouble shooting. Attend scheduled virtual training sessions, including ongoing training and development plans. Meet our seasonal needs as expected to run through the end of September 2019. Be able to provide a minimum of 25-29 hours of schedule availability, including weekend availability. An employee of Aspira, not an independent contractor! Click here for details and to apply. For more work from home jobs see our Newest Jobs & Gigs page. To be the first to hear about jobs we post, like our Facebook page. May you be working from home soon! This entry was posted in Customer Service Jobs, Hiring Companies, Work at Home Jobs and tagged Aspira, equipment provided. Bookmark the permalink.